The first measurement of inclusive Z → τ + τ − production in pp collisions at the LHC is presented, in the final states μ + hadrons, e + hadrons, e + μ, and μ + μ. The data sample corresponds to an integrated luminosity of 36 pb−1 collected with the CMS detector. The measured cross section is σ (pp → ZX) × B (Z → τ + τ −) = 1.00 ± 0.05(stat.) ± 0.08(syst.) ± 0.04(lumi. )nb, which is in good agreement with the next-to-next-to-leading order QCD prediction and improves on previous measurements in the Z → e+e− and μ + μ − channels. 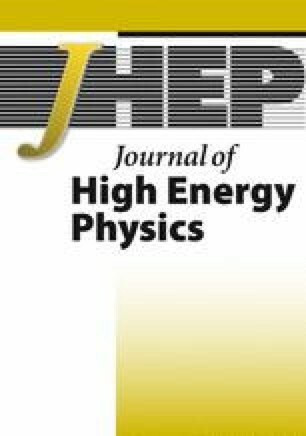 The reconstruction efficiency for hadronic τ decays is determined with a precision of 7%. CMS collaboration, S. Chatrchyan et al., The CMS experiment at the CERN LHC, 2008 JINST 3 S08004 [SPIRES]. R. Field, Early LHC underlying event data-findings and surprises, arXiv:1010.3558 [SPIRES]. M. Guzzi et al., CT 10 parton distributions and other developments in the global QCD analysis, arXiv:1101.0561 [SPIRES].